Austrian theologian; born July, 1846, at Adász-Tevel, near Papa, Hungary. He received his early instruction in the Talmud from his father, who was a rabbi. He then went to the gymnasium in Papa, and subsequently entered the University of Vienna, where he studied philosophy, at the same time attending the lectures of A. Jellinek and I. H. Weiss at the bet ha-midrash of that city. In 1867 he entered the Jewish theological seminary at Breslau, and continued his philosophical studies at the university there. In 1870 and 1872 respectively he published two of his prize essays: "Ueber Jacobi's Oppositionelle Stellung zu Kant, Fichte und Schelling" and "Ueber das Jüdische Kalenderwesen." Soon after leaving the Breslau seminary he received an invitation to become instructor at theLandesrabbinerschule, then being established in Budapest; but, as the opening of that institution was delayed, he accepted a call to Carlsruhe, Baden, as "Stadt - und Konferenzrabbiner." 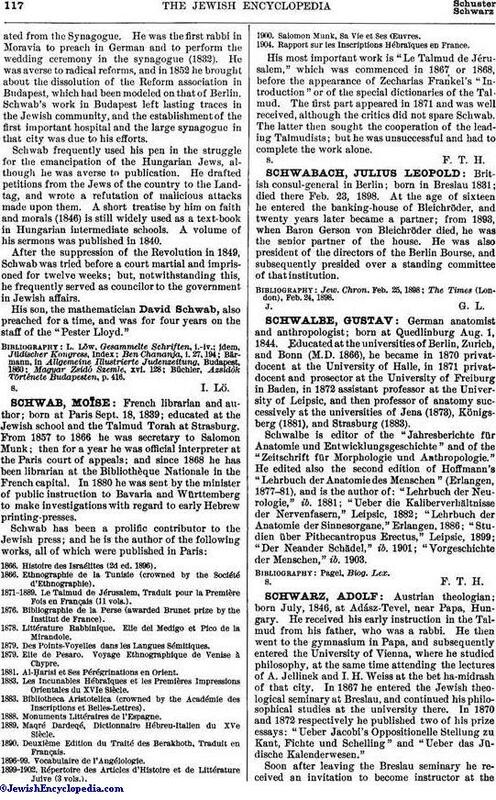 He occupied this position for eighteen years, and was then (1893) called to Vienna to become rector of the new Jewish theological seminary there, which position he still (1905) holds. Schwarz is a prolific writer on theological, homiletic, and philosophical subjects. He has published: "Sabbathpredigten zu den Wochenabschnitten der Fünf Bücher Moses," 5 parts, Carlsruhe, 1879-83; "Festpredigten für Alle Hauptfeiertage des Jahres," ib. 1884; "Predigten. Neue Folge," ib. 1892; "Die Tosifta der Ordnung Moëd "(part i., "Der Tractat Sabbath," ib. 1879; part ii., "Der Tractat Erubin," ib. 1882); "Tosifta Juxta Mischnarum Ordinum Recomposita et Commentario Instructa" (part i., "Seraim," Wilna, 1890 [Hebr. ]; part ii., "Chulin," Frankfort, 1902); "Die Controversen der Schammaiten und Hilleliten. Ein Beitrag zur Entwickelungsgesch. 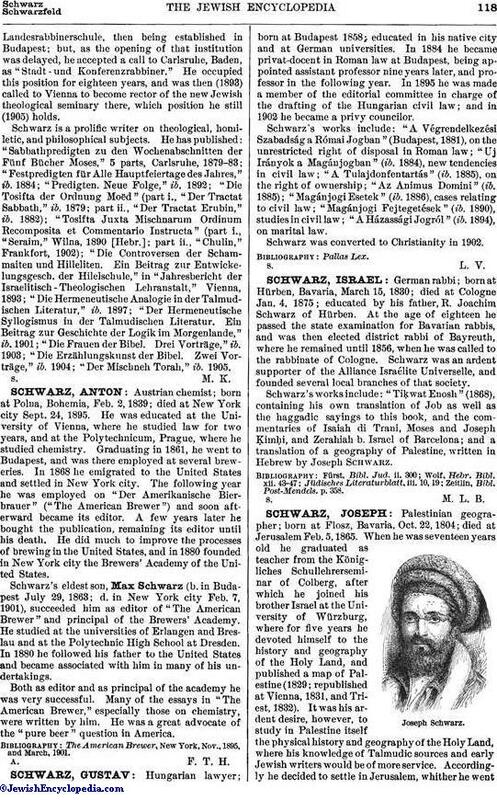 der Hilelschule," in "Jahresbericht der Israelitisch-Theologischen Lehranstalt," Vienna, 1893; "Die Hermeneutische Analogie in der Talmudischen Literatur," ib. 1897; "Der Hermeneutische Syllogismus in der Talmudischen Literatur. Ein Beitrag zur Geschichte der Logik im Morgenlande," ib. 1901; "Die Frauen der Bibel. Drei Vorträge," ib. 1903; "Die Erzählungskunst der Bibel. Zwei Vorträge," ib. 1904; "Der Mischneh Torah," ib. 1905.